At this friendly Chinatown International District spot, chef/owner Elaine Song specializes in the same kind of handmade dumplings her grandparents make. Lucky us! With Chinese New Year nigh, Seattle’s Chinatown International District was in full revelry mode on a recent Sunday, crowds and celebration filling blocked-off streets. After signing up on the automated list at much-lauded Dough Zone, the text I got said we were 25th in line (twenty-fifth!). Luckily, Elizabeth Kong, the marketing director at Seattle Chinese Times, had just told me about brand-new Jiaozi! That’s their exclamation mark, and this unpretentious, friendly little spot on Eighth Avenue South near Jackson earns it. Chef/owner Elaine Song specializes in handmade pot-sticker-style dumplings — you won’t find any other kind on the menu, and after you try hers, you won’t want to. She was born in Beijing into a restaurant family and came to Seattle at age 16. While getting a business degree at the University of Washington, she couldn’t find the authentic Northern Chinese cuisine she’d grown up with and loved, so she started cooking for herself and her friends. The traditional half-moon-shaped dumplings Song makes are called jiaozi, and her grandparents make them the same way for her when she visits them back in Beijing every year. It’s also considered good luck to eat a whole lot of jiaozi at Chinese New Year. And it’s Seattle’s good luck that after eating her jiaozi, Song’s friends insisted that she open her own restaurant. Now we have Jiaozi! 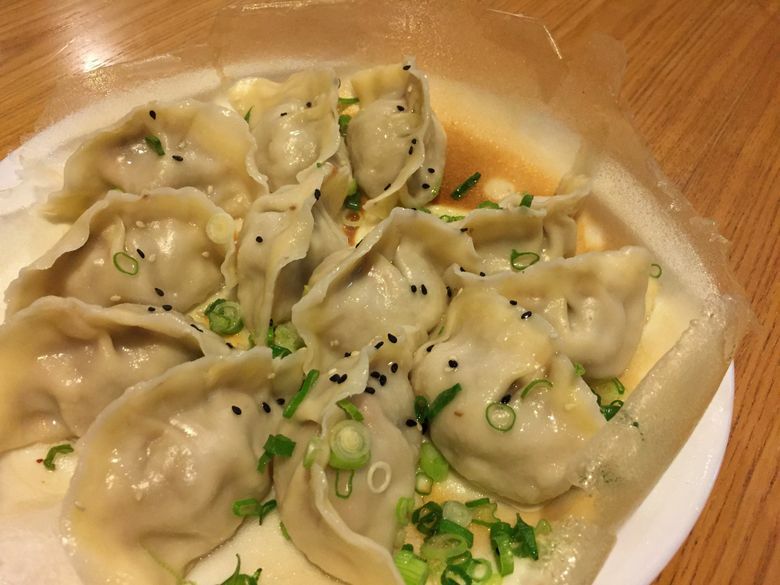 The dumplings: So yes, Jiaozi! only serves jiaozi, but there are 11 different filling options (including a couple vegetarian ones), either steamed or pan-fried, a dozen to an order ($9.99-$13.59). The fried jiaozi are happily corralled by a super-thin, lacy-crisp outline of the pan (instantly recognizable to a Little Ting’s fan). The fresh-tasting wrappers are thick enough to be hearty, thin enough to avoid doughiness — just right. With whole shrimp and an enlivening amount of chives, the juicy pork-and-shrimp-filled jiaozi surpass others in their class; the lamb-and-carrot ones are beautifully cumin-scented, with the carrots adding a bit of sweetness to the tender ground lamb. They all come topped with black and white sesame seeds, plus green onion for a little extra color and pepperiness. (Don’t neglect the tabletop sauces — garlic soy, vinegar and chili oil to mix to your dipping-liking.) Song’s not tired of jiaozi yet. “I still really like to make them!” she says. And hers are really, really good. 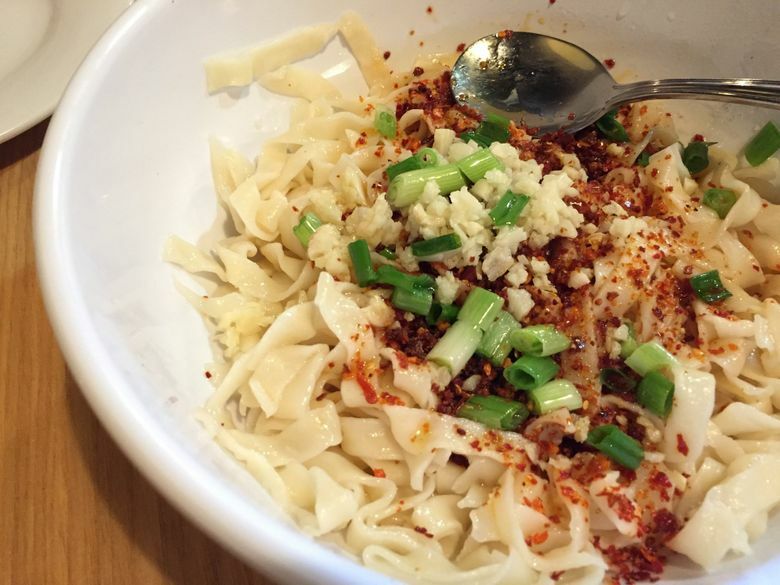 Elsewhere on the menu: You’ll see Jiaozi!’s spicy-seared handmade noodles ($9.99) on almost everyone’s table, for good reason — it’s another family recipe. 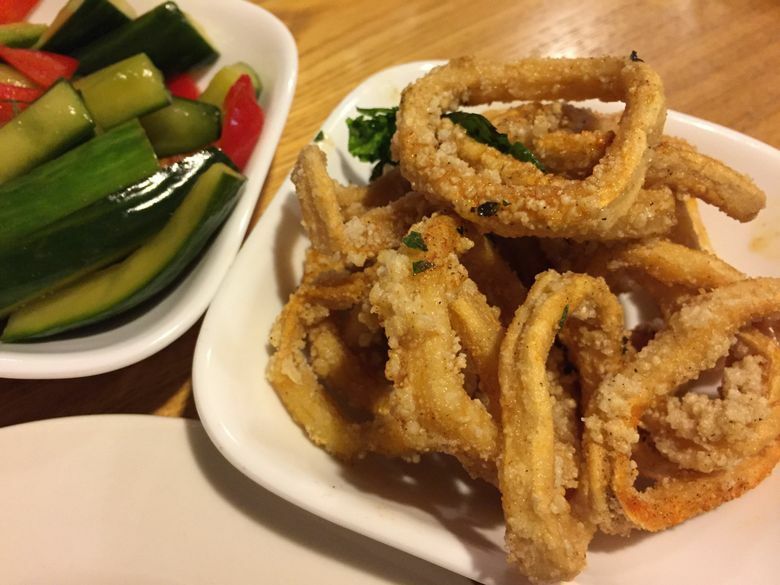 The salt-and-pepper squid ($5.75) is a dish of thin, still-bouncy rings, not too heavily crispy-coated, though arguably in need of a bit more pepper. A sweet-and-sour cucumber salad ($4.99) also wanted a little more flavor (and responded nicely to some added chili oil). There’s lots more to try, from popcorn chicken ($5.75) to spicy-brined pig ear ($6.25), and Jiaozi!’s version of the savory Japanese treat takoyaki ($6.50), made in-house just because Song loves them, is a good one. The service: On a second visit, we noticed a shiny-gold-wrapped box with a hand-sized hole in the top. Our server said it was for prizes for Chinese New Year, then let us each pick out a card, but no dice. She laughed and kept pulling them out — one, two, three more — until, finally, “Free dessert!” It was our lucky day! 414 Eighth Ave. S. (Chinatown International District), Seattle; 206-602-6253; Tuesday-Friday 11 a.m.-3 p.m. and 5-10 p.m., Saturday-Sunday 11 a.m.-10 p.m.